Hilary Sharpe Chairperson of Arklow Parish Council presentation speech to Ronnie Delaney. Good afternoon and Happy New Year to all present. On behalf of the Parish Pastoral Council I extend a very special welcome to you all and grateful thanks for being here today to celebrate this special event, when, since the 1860’s this beautiful Church has served as a focal place of worship for the people of Arklow. The world was a very different place then, and a lot has changed over the years. But there is stability too, and the commitment of our Faith and devotion still mark our gatherings in this beautiful Church. For a Parish that has such an interesting heritage and generations of family traditions, this coming year will be the perfect opportunity for us to celebrate together, this very proud and significant year in our Community. We should all try to follow these very significant words of encouragement to help us to achieve our own personal goals and believe that we too can win the race. 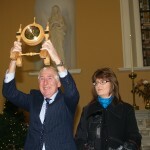 I would now like to invite Mr. Ronnie Delaney to the altar to present on behalf of the Parish a piece of Arklow Maritme History, this beautiful clock, which was crafted by a local man, Mr. Brendan Tracey, using part of the timber from the mast of Asgard 2, which now lies at the bottom of the Sea. Mr Delaney please accept this gift, which is a small token of our appreciation for your presence here today. Thank You and May God Bless you.